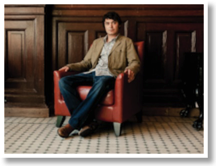 Songwriter-singer-guitarist Max Gomez’s 2013 debut Rule the World enveloped the surroundings of The Belmont, a small venue that features an outdoor concert area likened to a private courtyard. Standing in a plaid shirt with a simple white tee underneath, denim jeans, and boots, his simple style matched his unadorned musical backing filled with lyrical themes of self-discovery, heartbreak, and life’s travails. A high point was “Ball and Chain,” a lonesome folk-blues that hearkens to his inspirations Big Bill Broonzy (“Key To the Highway,” “Get Back”) and folk troubadour John Prine (“Sam Stone,” “Hello in There”). He sang the words “I know someday I’ll be free” as if he experienced spiritual imprisonment without any flashiness. His mix of Americana, coated with crooner “ooh” flourishes and Johnny Cash-Bob Dylan subdued vocals, coursed through the rest of the numbers, from the uniform strummer “Run from You” to the elegiac bildungsroman “Cherry Red Wine” (“throw my ashes out to sea…a chance of feeling free”). The poetic “Rule the World” (“Give a run for your worth/And play the cards at hand/Fight the troubles at birth/And know where you stand”) evoked medieval imagery set to the tune of affection and adoration. Standing alone, guitar in hand, with no gimmicks, Max Gomez channeled intimacies and storytelling with ease and integrity, fitting perfectly with the vintage surroundings and outdoor stage. His vocals, penmanship, and soft-spoken sounds remained relatable, signaling the idea that he might just be one of the next performers to rule the roost of roots music. 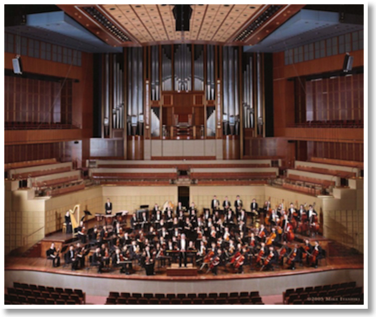 It was the Greater Dallas Youth Orchestra's 2014 Finale concert and softly discordant tones of individual instruments warming up filled the Morton H. Meyerson Symphony Center in Downtown Dallas. The first song performed was Antonin Dvorak's Slavonic Dance No. 8 (Op. 48 No. 8). It was originally written for four-hand piano in 1878, and the Slavonic Dances were inspired by the Hungarian Dances of Johannes Brahms. However, unlike the Brahms dances, the Slavonic Dances are not based on traditional folk tunes; they are original melodies that Dvorak wrote in tribute to the style of the dances of his native Bohemia. The piece goes through two main themes. The first is introduced right at the beginning of the dance and features an upbeat and exciting atmosphere. The music travels through various parts of the orchestra with great energy. About halfway through the dance, a second, more relaxed theme emerges. It conveys much calmer melody but remains uplifting and happy. This piece flaunts proof that music in a minor key can still be quite spirited. The orchestra then jumped right to their next piece, which included three dance episodes from Leonard Bernstein's Broadway musical, On the Town. The first episode, titled "The Great Lover" is fast paced and jaunty. The horns played quick accented notes through their exciting and melodic passages. The persistent percussion brought a very celebratory feel to the episode, successfully conveying the image of the smiling, dancing sailors of On the Town to the audience. The second episode, "Pas de Deux," contains beautiful verses that are obviously meant to accompany the story of a city girl falling in love. The episode ended with graceful notes from the flute, leaving the audience with a tingling feeling of unanswered love before the orchestra jumped into the last episode. "Times Square: 1944" picked the pace back up, returning to the high-tempo, jaunty feel of the first episode. It is filled with movement, and the structure of the piece revolves around featuring each section of the orchestra in turn, one after another, as if different sailors are trading the spotlight, dancing. The episode ended with the full orchestra coming back together and reaching a thrilling final crash. The next piece was also from a production score, though this time from a film—“Catch Me If You Can” by John Towner Williams. They took a few moments to rearrange the stage to make room for showcasing the three soloists: Don Fabian on saxophone, Chris Coltman on vibraphone, and Harrison Dearman on bass. The first Escapade that they performed was "Closing In." The orchestra incorporated some audible sounds such as snapping fingers and saying "Shh!" alongside the saxophone solos. The alternating triplets in the saxophone's melodies and the percussion lends to the pleasant ebb and flow of the piece. The second Escapade, "Reflections," paints a very serene picture of contemplation as the orchestra and saxophone exchange thoughtful dialogues. Fabian's performance of this section contributed much emotion to the sensitivity of this moment in the movie. This Escapade provided a stark contrast to the two other more upbeat parts. "Joy Ride" whisked the audience away in complete pleasure and joy. The soloist's light staccato was accompanied by plucked strings in the orchestra and cheerful bells. The dynamics swelled and the tempo raced, generating an atmosphere of general celebration. The piece gave an exciting end to the first part of the performance. After the intermission, the GDYO tackled one of the most acclaimed compositions in classical repertoire, Tchaikovsky's Fifth Symphony. The musical work began with a lengthy introduction which was rather muted and dark in tone. A march theme is introduced, and variations of the march and the initial themes play throughout this first movement. The GDYO played the second movement expressively. The tempo is slow, and the chords are majestic. This movement also contains one of the most famous horn solos, which is always a treat to hear. The third movement, Valse, opened somewhat timidly, but it soon accelerated into a cheerful intermezzo. The second half of the movement is lively and incorporates recapitulations of themes from the first movement. The Finale has a slow introduction, revisiting the march theme from the first movement, though in a major key rather than the original minor key. It ends trumpeting themes from the first movement, bringing the piece full circle. The audience burst into applause as each section of the orchestra was recognized, and everyone rose for a standing ovation as the entire orchestra stood. The Greater Dallas Youth Orchestra's energy seemed to excel with this season Finale, and at least for many in the audience ended their year with a marvelous and rewarding performance.